AUSTELL, GA (June 14, 2018) – Today YKK AP America, Inc. (YKK AP) expands its unitized offering with the introduction of a new thermally broken, unitized curtain wall. The YUW 750 TU is built to deliver the highest level of design versatility and exceptional performance, regardless of climate or location. The YUW 750 TU offers architects design freedom through the captured or structural silicone glazed options offered. The captured frame features a 2 ½ in. 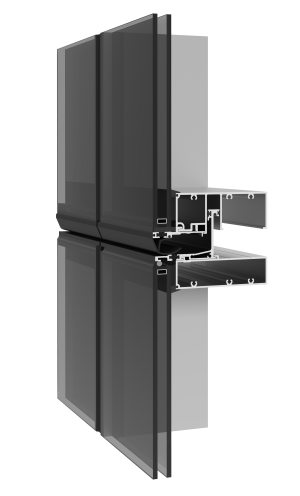 sightline while the 4-side structural silicone glazed frame features zero sightline creating a sleek modern look. Both framing options offer a high level of structural soundness. “In addition to providing the many fast and easy installation benefits of being shop-glazed, the YUW 750 TU is a highly efficient and sustainable product that provides a range of options that will enable architects to design with the environment and aesthetics in mind,” continued Turner. The YUW 750 TU boasts maximum thermal performance with a U-Value of 0.41 BTU/HR/FT²/ºF or less, and easily interfaces with sun shades to achieve even greater sustainable performance. YKK AP’s ThermaBond+ process enhances the adhesion of polyurethane material to aluminum extrusions, which significantly improves adhesion and prevents dry shrinkage. In the case of extreme surface temperature (180 degrees F/82.2 degrees C.) the thermal movement avoids buckling stresses on glass, joint seal failure, undue stress on structural elements, damaging loads on fasteners, and performance reduction. YKK AP will showcase the YUW 750 TU at AIA Conference on Architecture 2018 on June 21-23 at booth number 507. For more information about YKK AP or its products, please visit ykkap.com.